No individual animal in a genetic prediction ever has an accuracy of prediction of zero. The information from the calf's relatives brings in substantial amount of information. What are the advantageous of genomic prediction? 3) Avoid prolonged generation intervals. 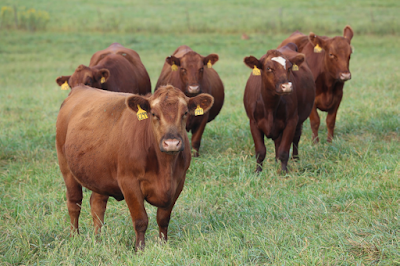 For many selection decisions in beef cattle, we make many selection decisions around a year of age. 4) Reputation. This is hard to quantify in dollars and cents! MacNeil's definition is making cattle that are more profitable in the next generation. This can be boiled down to income minus expense. MacNeil uses a computer model to estimate the effect of changing one trait by a unit of measure and seeing how that influences profit. Is an abstraction of any actual beef production system. For these models, MacNeil simulates many animals. For feed efficiency simulations, MacNeil used 5 scenarios. Going from phenotype to genomics has a fairy substantial jump. Going from a low accuracy genomic prediction to a high accuracy genomic prediction also has a big jump. When we have pedigree predictions with lots of phenotypes, there is no benefit from adding genomics. "If you have a bull with 200 progeny records, don't waste your money on genomics," MacNeil said. How many breeding objectives (economic selection indexes) should we have? MacNeil did an analysis. In South Africa, you receive discounts when the carcass weighs 500 pounds. The correlation between the South African index and United States index was 0.68. The breeding objective in South Africa would work fairly well in the United States. The differences in breeding objectives across the United States are minuscule across environments in the United States. In other words, use indexes! They work! Genomics only helps birth weight predictions by 9%. Genomics helps dry matter feed intake by 41%, because there are many fewer feed intake records. For a maternal objective, fitness drives the bus. The cow needs to stay in the herd. This accounted for 50% of the value in the breeding objective. For stayability in beef cattle, adding genomics had a 76% improvement in the accuracy of genetic prediction. This is because this trait is measured later in life and there are fewer phenotypic records. In a terminal objective, we increase accuracy by 27%. If we generate 60 harvested progeny per sire, we earn $169 per genomic tests. If we generate 15 replacement heifers on a bull, we earn $159 per genomic tests. "You are on the order of 4 times the cost for return, based on the cost of the test." MacNeil said. With reasonable transfer of economic benefits from commercial to seedstock sector, it indeed does appear that seedstock producers can afford genomics, provided they use rational breeding objectives. "I started this exercise believing the answer was no." MacNeil said. "I believed it was a shell game about the perception of the value of the technology." MacNeil proved to himself that he was wrong. Multi-trait breeding objectives keep you from going too far down the wrong path. They put the right amount of emphasis on each trait. Tandem selection and independent culling levels are both less effective than breeding objectives through economic selection indexes. If we chase one trait, then run into a problem, select for a second trait, run into a new problem, so chase a third trait- this is tandem selection. MacNeil stated, "I am troubled by the Angus $B index, as it is an incomplete objective" (i.e. it only takes part of the production system into account, not from conception to slaughter). But, using $B is MUCH better than using the individual component traits. See bifconference.com for PowerPoint and Proceedings. While many of the cattle that are on our farm or ranch are selected at a year of age, the ages of AI sires can vary greatly. Thus, AI sires may be a potential opportunity to decrease the generation interval. While commercial producers should likely use proven AI sires, this may not be the case for most seedstock producers. Using younger AI sires may be low hanging fruit for many seedstock herds. 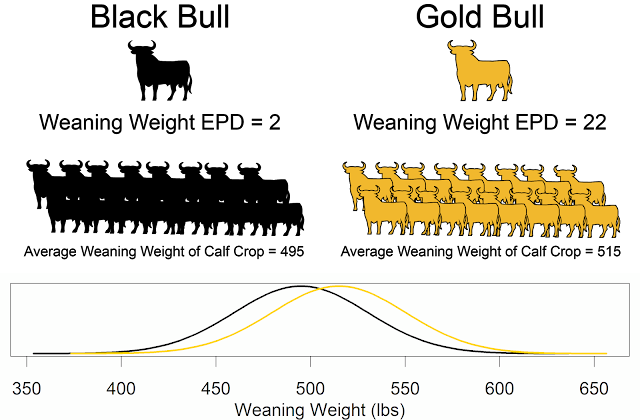 Use genomics and use economic selection indexes so that your breeding decisions are rational.